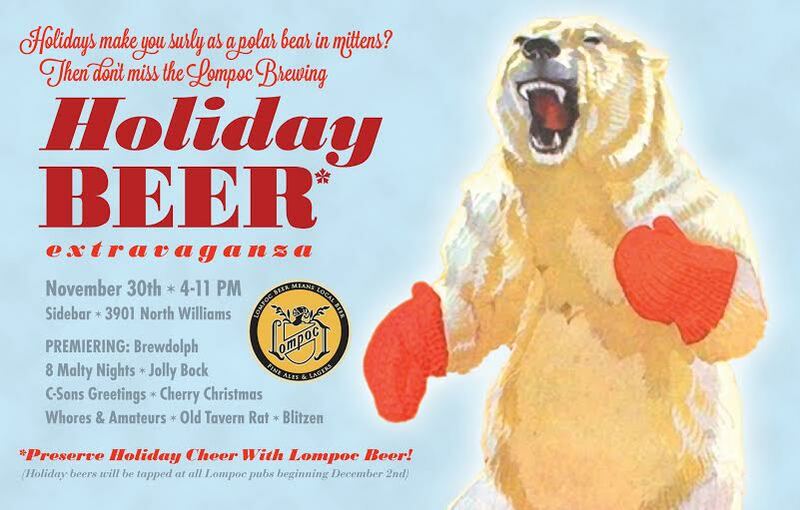 PORTLAND, Ore. – Just as Santa has eight reindeer, so does Lompoc have eight different holiday beers, including one brewed for Hanukkah. The annual Lompoc Holiday Beer Extravaganza will celebrate the release of them all on Monday, Nov. 30 from 4 to 11PM at Sidebar, Lompoc’s barrel tasting room at 3901 N Williams Ave. This year's lineup of holiday seasonals includes 8 Malty Nights, Blitzen, Brewdolph, C-Sons Greetings, Cherry Christmas, Jolly Bock, Old Tavern Rat and Whores & Amateurs. A detailed description of each beer is provided below. All beers will be available at the four other Lompoc pubs beginning Dec. 2, including Lompoc Tavern on NW 23rd Ave, Oaks Bottom Public House on SE Bybee Blvd, Hedge House on SE Division St, and Fifth Quadrant on N Failing and Williams. C-sons Greetings is also available in 22 ounce bottles. A long-time Portland craft beer fixture established in 1996, Lompoc (pronounced Lom-Pock, not Lom-Poke) creates seven flavorful year-round beers, plus a ridiculous number of seasonals. You can find Lompoc in 22 oz bottles and on draft at locations in Oregon and Washington, and at its five Portland neighborhood pubs: Fifth Quadrant and Sidebar in North Portland, Hedge House and Oaks Bottom in Southeast, and the Lompoc Tavern in Northwest. For more information, call 503-288-3996 or visit www.lompocbrewing.com and @LompocBeer on Facebook, Twitter and Instagram. Drink Local, Drink Lompoc!